Edmund was the son of a king of East Anglia, one of the early small kingdoms that composed primitive England. He was born around 840, at a time when Christianity had already spread in various regions of England. His father, a man of great piety, abdicated his throne to his son when Edmund reached age 15. He then traveled to Rome and retired in a monastery to dedicate his last years to meditation and prayer. Edmund showed himself a model ruler and Catholic from the first. In addition to being just and good, he was also a man of extraordinary energy. He realized the danger the Scandinavians represented to his country and prepared it militarily for possible war. He was not mistaken in his prevision. The Danish soon attacked the English dominions, and particularly his kingdom. In the first attack in 870, he bravely repulsed two Danish chiefs. They so returned, however, joined by other aggressors, and overtook St. Edmund by their great numbers. He was taken prisoner, loaded down with chains, and brought before the Danish chieftain Hinguar in Hoxne (Suffolk). The Danish chief made various proposals of peace to St. Edmund, but since they went against the Catholic Religion and interests of his subjects, he would not accept the terms. He was cruelly tortured, and finally decapitated on November 20, 870. A national council held at Oxford in 1122 designated November 21 as his feast day. His remains were eventually removed to St. Edmundsbury Abbey. Later the relics, including a psaltery he used daily, were moved to the Abbey of Cluny in France and conserved there until the Protestant wars. There are several interesting points in the life of St. Edmund. First, to understand the historical situation, one should realize that the Scandinavians of that time were the great danger to the civilized peoples. Today they are so pacific that is hard to believe, but actually in the past they were the tyrants of the seas. 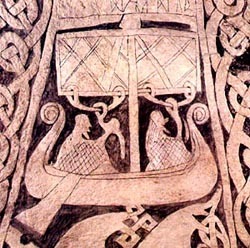 From the Scandinavian peninsula they traveled by sea and river throughout Europe. They represented the last wave of barbarian invasions in Europe. Known as Vikings, they were sea-faring adventurers who practically lived in their ships making piracy everywhere. 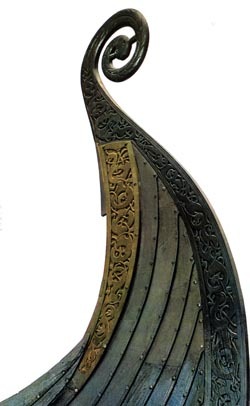 By the way, their longboats had very beautiful bows, which symbolized well their courage and audacity. Today these military characteristics have almost disappeared in the Swedish and Danish mentality. The Vikings were, therefore, the great enemies of the time, and St. Edmund prepared his people to face an invasion by these barbarians. Second, after a glorious defense and initial triumph, St. Edmund was defeated and taken prisoner. He was obliged to negotiate with the victors, who demanded that he relinquish important advantages for his kingdom. He refused to do so, since such terms would favor the re-establishment of Paganism in his lands. He resisted and died. You can see St. Edmund’s high understanding of his public mission, his keen consciousness of his role and obligations as king in both the religious and temporal spheres. Today many people defend the separation of politics and religion without knowing what they are talking about. For today such a separation is becoming just theoretical since religion interferes in politics more than ever. Nonetheless politicians fear to touch topics regarding religion. 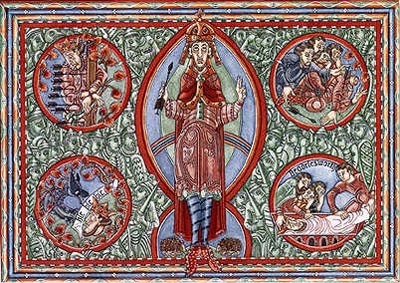 You can see the thinking of St. Edmund in his time: to install a pagan dynasty in his kingdom would represent the paganization of the state and its people. Thus it could cause the apostasy of his people and the loss of their souls. He understood perfectly the link between politics and religion. Because of this he did not accept the proposals of the Vikings. For this, he was martyred. Third, probably one reason the Vikings wanted him to make a concession was because of the personal prestige he enjoyed in the kingdom. This is reasonable because it would be difficult to consolidate the conquest of the kingdom without the support of its leader, St. Edmund. He probably also understood this, and refused to accept the terms of his enemies moved by the hope that his subjects would raise up a strong resistance, a kind of guerilla war against the occupying power in order to save the Catholic Faith. He probably shed his blood with the hope of a Catholic political reaction. Fourth, his blood gave fruit, since soon after this England became a Catholic ensemble of kingdoms that used to be called the Island of the Saints, given the number of saints that bloomed there. Fifth, his life is a wonderful example for those who govern in the modern Church and state. For until the time when Catholic nations will be governed – in both the temporal and spiritual spheres – by men who are disposed to shed their blood, nations will not have worthy men to govern them. Only men who are faithful to the principles to the point of offering their lives for them can govern well. Just as a military officer who is not disposed to shed his blood is worthless, so also with a civil governor or a Bishop – they are worthless. The higher the position, the more courage and dedication is demanded. We don’t have high positions and titles, but we have a vocation to defend the Catholic Church from the enemies within, which is a high vocation. Often a high vocation is more than a high position. Let us pray to St. Edmund to give us statesmen and Churchmen who have this spirit of dedication to the true cause. Let us also ask him to give us the determination to be faithful until death to our vocation.